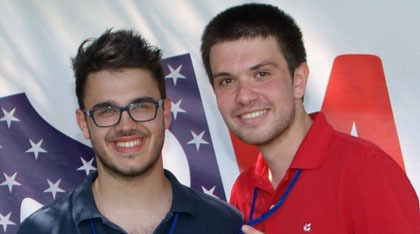 In Macedonia, Summer Work Travel (SWT) alumni formed a group called the SWT Alumni Association Macedonia (SWTA) – the first of its kind founded by former participants of a privately-funded exchange program. Since its creation, the SWTA has been very active in its outreach efforts to Macedonian youth. SWTA members speak publicly about their exchange experience in the United States, encourage young people to take advantage of the opportunities offered by the Summer Work Travel program, and promote entrepreneurship, volunteerism and leadership among its members. Watch personal stories from J-1 visa participants. This past summer, the Bureau of Educational and Cultural Affairs awarded Alumni Engagement Funds to the SWTA. The winning project, entitled Let’s Fund It, was selected among a host of proposals submitted by alumni of State Department programs worldwide. The project will develop 200 Macedonian youths’ skills to identify economic opportunity, stimulate innovation, and cultivate entrepreneurism.